Cardio Tennis was launched in 2005 with a goal of getting people to rethink how they viewed tennis. Many people regard tennis as a recreational activity but not for fitness or for losing weight. Yet, during a 60 minute Cardio Tennis session, you can burn some serious calories. Depending on your exertion, it can be as much as in a spinning class or other high-intensity cardio. However, you also have a lot of fun so it is ideal for keeping fit and losing weight. The workouts are taught by a certified tennis professional who leads students through a series of short warm-up drills, a cardio-vascular workout phase and a cool-down phase. The specific activities vary in each class, but the cardio session can include many fun drills and games that involve hitting tennis balls. The activities are designed to keep the feet moving and will most likely also keep a smile on your face. If you are apprehensive about attending a class due to lack of tennis knowledge or ability, fear not. Tennis talent is not a requirement in Cardio Tennis. Classes are available for people at a variety of skill levels, from advanced to never-held-a-racket-before. Unlike a regular tennis match, which depends on each player's ability to return a volley or serve, Cardio Tennis players are mostly swinging at balls that are being fed by the instructor. If you lob every ball out of the court or swing at nothing but air, you can still keep fit because you are constantly moving. Cardio Tennis is for anyone interested in having a good time while working out and nobody is concerned where or how you hit the ball. Cardio Tennis instructors focus on getting participant's heart rates up to their target cardio zone. The best way to do that is to make the class fun so players work harder without even noticing because Cardio Tennis is so entertaining. If you having fun, your motivation is higher, and you will much better results. 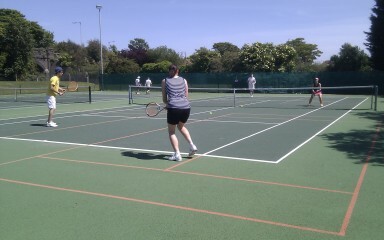 The social interaction in Cardio Tennis helps increase the fun factor. of the drills and games involve playing doubles or team matches with other participants; a far cry from the solitude of a workout machine. To ensure that all of that fun is truly yielding results, you can wear a heart-rate monitor to make sure that you are within your target heart-rate zone. So why is Cardio Tennis such an effective workout? It is the very nature of the game of tennis itself. Playing tennis involves running after balls and swinging racquets high and low. That kind of activity engages the entire body and the body works more efficiently when it is trained as a whole. Programs that focus on multidirectional moves force the body to engage more muscles in the workout, allowing the body to build in a complete way. Traditional machine workouts like treadmills, cycling and rowing machines deploy the same muscles repetitively, while leaving out other muscle groups. Still not sure if Cardio Tennis is for you? The only way to know for sure is to have a free try. Expect to have fun, get a great workout, improve your tennis, be entertained, and expect to view tennis in a different way.